Aren’t these the cutest little tarts you’ve ever seen? Believe me, they tasted even better than they look! 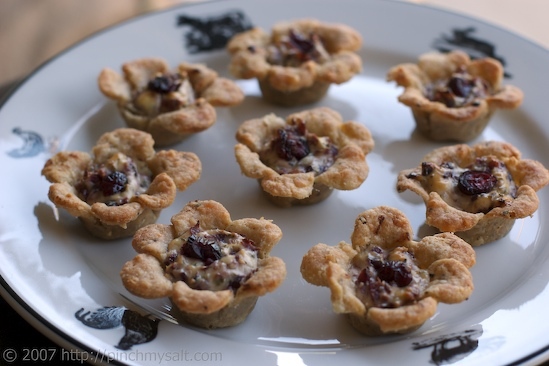 I ended up making three things this morning to take to Thanksgiving dinner: cranberry and goat cheese tartlets (pictured above), three cheese tartlets with bacon and fresh thyme (pictured below), and a butternut squash casserole (forgot to take photo). All three were terrific but my sister and I both agree that the flower-shaped cranberry tartlets were both the tastiest and prettiest of the three. 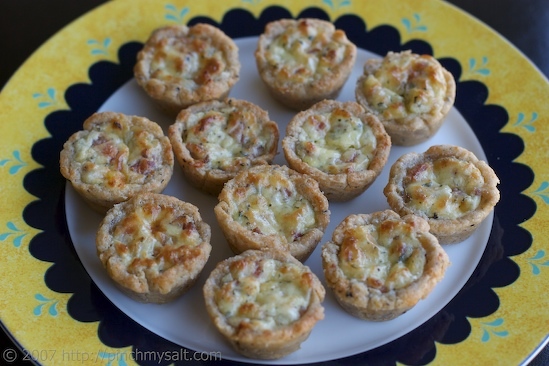 But if you ask my brother-in-law, the three cheese tartlets with bacon and thyme were the best! I used the same tart pastry for both. The pastry is made from whole wheat pastry flour, butter, shredded Gruyere cheese, cracked black pepper and salt. I basically just made a basic pie crust dough but used whole wheat flour and added the cheese and black pepper. It was absolutely amazing! I don’t have an exact recipe because I made the tarts up as I went but they were so good that I will be making them again and writing down an actual recipe to give you before Christmas. I used a mini muffin pan for baking both sets of tartlets. For the flower shaped ones, I used a flower shaped cookie cutter. I rolled the dough out to about 1/8 inch thickness then cut the flower shapes. I then fit the flowers into the mini muffin cups with the petals sticking up a bit so that they didn’t crowd each other. For the cranberry filling, I mixed a mini log of goat cheese, a handful of chopped sweetened dried cranberries (Craisins), a teaspoon of fresh chopped thyme, salt and fresh ground pepper, and one egg. This made exactly enough filling for twelve tarts. For the bacon cheese tartlets I just used a drinking glass to cut the pastry dough into rounds and then fit them into the mini muffin cups. It just so happened that the glass I chose was the perfect size! For the bacon and cheese filling, I mixed one small log of goat cheese, some shredded sharp cheddar cheese, some shredded jarlsberg cheese, three slices of bacon, cooked and crumbled, a teaspoon of chopped fresh thyme, sea salt, coarsley ground black pepper, and one egg. This made more than enough filling for 12 tarts. Next time I make these, I’ll be sure to take photos of the assembly process. They were fairly easy to make but a little time consuming since I had to roll out and cut the dough. I only made 12 of each because this whole thing was an experiment and I wasn’t sure how they would turn out. I definitely should have made at least twice as many! They disappeared as soon as I put the plates down (half of them went in my brother-in-law’s mouth). These all look amazing Nicole, I can almost smell them! We all missed you guys very much this year, hope to see you guys soon! How cute! I love little bite-size treats. They look like little flowers, sweetie! So beautiful! You are inspiring me to crank up the oven again when I have been baking none-stop all week already! Ooh, yum! They're adorable and they look delicious, Nicole. 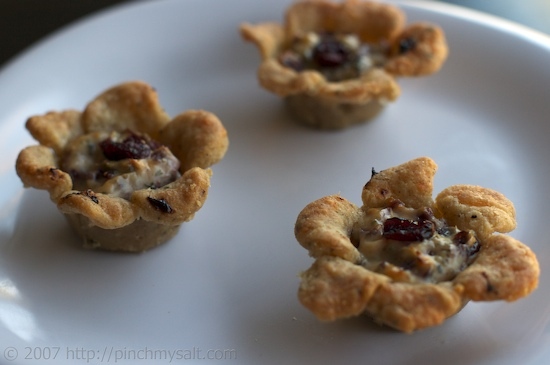 What a great idea to use a cookie cutter for your tartlettes. Thanks for sharing. Happy post-turkey day! 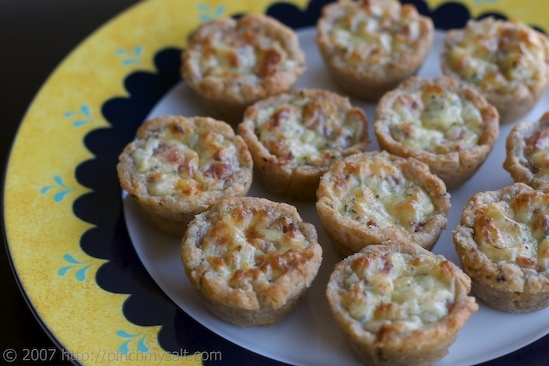 I came searching for ideas for mini tart crusts. The flower idea is so cute, and I already have that cutter! 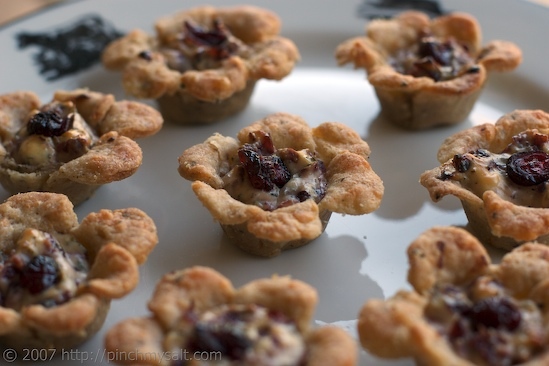 Those mini tarts are precious...& I love the idea of using the flower cutters. Will attempt to make these for my daughters 13th which is round the corner! Thanks for a wonderful post!! Hi :o) These recipes look so delicious and I want to try them ASAP. However, I am such a novice to baking that I don't dare try these (or anything really..lol) without a recipe. I was wondering if you ever did post a detailed recipe for these adorable bites!I LOVE your site! I happened upon it about a week ago and I have been to it just about every day since! So many ideas...thanks a bunch! Nicki - I'm sorry, but I never did get around to writing out a recipe for these. Perhaps I'll try making them again in the fall and post the recipe. Thanks for the reminder!